Actuaries can make a very high salary, but it takes a ton of work. Here's what you need to know, recommends Steve Fiorillo, writer for TheStreet. Are you someone with a love of data and statistics? Someone with a keen interest in computer software? If you're a math whiz, or even just someone with a passion for the subject, an awful lot of companies could use you and there are ways to make a career out of it. One such career is an actuary. It's a career that may be heavily associated with insurance but can be far more wide-reaching than that. If you put in the work needed to become a professional actuary, you could find yourself in a lucrative, stable career. But be warned: it's a lot of work. If you think this could be a worthwhile line of work that's worth the prep, you'll need to ask: what is an actuary, and how can I become one? An actuary is essentially an analyst for risk management, doing the math to figure out how risky something might be and determining how best to minimize it in the future. Actuaries are most often needed in the insurance industry where there is a lot of financial risk involved in health insurance, life insurance and home insurance. Here, actuaries use data and a number of factors to determine just how risky an insurance policy is to give to someone. An actuary is expected to determine how likely a risky scenario is to play out - and then determine a way to minimize that damage. If risky events keep happening, an actuary could be asked to use their numbers to figure out how to decrease the times they occur. Actuaries are expected to be in high demand over the next several years, so it's smart to get prepared for it sooner than later. Becoming an actuary is a multi-step process that is still ongoing even in the beginning of your actual career. 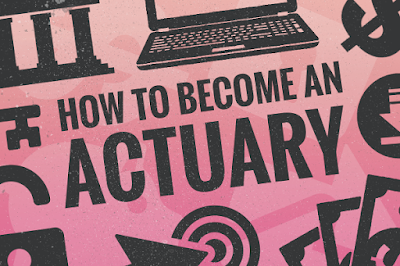 Here's how to get your start as an actuary.